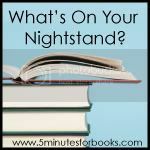 It's time once again for What's On My Nightstand over at 5 Minutes for Books. I'm still trying to stay with the 3-book plan, which has been made easier with my new found love of the audio book. ~Lady Susan . A quick and delightful book of letters. Obviously early Jane, but fun nevertheless. ~How Do I Love Thee? I didn't know the story of Elizabeth Barrett Browning. This was an interesting novelization of her life, with plenty of strange truths. ~Loving the Church: God's People Flourishing in God's Family. I wasn't particularly fond of the format of this one, but John Crotts has some really good things to say about the role of the church and the members within it. ~Year of Wonders: A Novel of the Plague. To say I enjoyed novel about the plague in a small 17th century England doesn't quite fit, given the subject matter. I will say that it is a compelling study in how people deal with tragedy. The ending left me unsatisfied, still I would recommend this book. ~Bonhoeffer: Pastor, Martyr, Prophet, Spy (audio, biography). I'm finally on the last disc. It's been a very interesting story, although a bit long and detailed for my taste. I have learned much about the Third Reich and Hitler's power over Germany, and have been fascinated by the Christians who opposed him. ~The Sweetness at the Bottom of the Pie (fiction). I decided to give this a whirl after reading Carrie's post that included it among books she's happy were recommended to her. I'm only a few chapters in, but already adore Flavia de Luce. I can't wait to read the next two books in this series. ~A Walk with Jane Austen: A Journey into Adventure, Love, and Faith (biography). This one has been on my list forever, but I am going to get to it! ~Christianity and Liberalism (Kindle, non-fiction), as part of Challies' latest Reading the Classics Together. ~The Sisters from Hardscrabble Bay (fiction). Concern about what I've been reading - particularly fiction - has been gnawing at me. I didn't understand it at first, because I'm very careful to choose "clean" books (I find certain language offensive). Still, I decided to cull my bookshelves again. I had accumulated a large number of Christian romance novels, but the prospect of reading them no longer appeal to me. Then I read this article by Russell Moore, which confirmed my convictions. I'm determined to focus on classics and works that are more thought-provoking and witty (while clean at the same time). If I want to be more intentional in my life, I must also be more intentional in my reading. What about you...what are you reading these days? Are you intentional about what you read? Do you have any recommendations for me? You can visit 5 Minutes for Books to see what others are reading. I really liked Year of Wonders too. Amazing, the way it brought the era to life! I saw Loving the Church over at Reading to Know awhile back. Thanks for reminding me about this one. Lady Susan -- I'm always up for a free Kindle book! Reading your list reminded me that I’m “reading” Tim Challies’ audiobook this month so I added it to my nightstand list. I want to tackle Bonhoeffer, but I’m still scared too because of its length. I heard an interview with the author on Focus on the Family though and it really has me even more interested in reading it. I love how you’re sticking with your 3-book plan! Your intentionality is inspiring. The Organized Heart! Now that sounds like something I need to read! Looks like you have a busy month. Happy reading! Great list! Wasn't Lady Susan fun? I didn't care for A Walk With Jane Austen. Organized Heart was good. I'm hoping to join in with Challies again this time too. The Sweetness at the Bottom of the Pie looks really good, I keep meaning to pick that one up! Happy Reading! I had not heard of that one by Austen. I'll have to investigate. I loved that book about Browning. That's the only one of Moser's I have read but I'd like to explore some others. I have Loving the Church on my shelf but haven't started it. I read Moore's post and agreed with much of what he said. I think we should be more discerning with what we read. There are so many books available and not enough time to read them all, so why not be selective and make sure the ones we read are quality books? I'm also reading Bonhoeffer right now and enjoying it. How Do I Love Thee was a really good book! I hope you like A Walk with Jane Austen more than I did! I just thought it was rather dull, which surprised me because it should have been a really good book. Trying to think if I have any recommendations but I'm drawing a blank right now. I've been digging deep in Bonhoeffer and haven't been reading much else. I hope you have a great reading month! That article by Moore was really excellent. My mom has been talking about romance novels and emotional p.orn for years--it was interesting to see an academic look that confirms that idea. For my part, I try to be intentional about having variety in my reading. I find that when I'm reading a steady diet of romance novels (or books about parenting or about weddings or about home maintenance or...) I become easily discontent with the life God has me living right now. On the other hand, when I vary my reading, I'm less likely to dwell on everything I don't currently have--and more likely to praise God for what I DO have. Ooh, some great suggestions here - The Organized Heart is quite intriguing and I'll have to check out "Sweetness" now that I've heard about it more than once as good. An Organized Heart just went to my TBR list! I think I would like "How Do I Love Thee?" and "Years of Wonder?" I love historical novels. They might be my favorite. Plus, years ago I read a non-fiction book about Elizabeth Barrett-Browning's love story and courtship with Robert. It was great. I'll have to try to figure out what it was! Happy Reading! A Place for Weakness looks good as does The Organized Heart which is alreadu on my wish list! I may join CHallies book reading as well, I have yet to decide. I liked How Do I Love Thee? as well. Hardscrabble looks interesting; hadn't heard of that title! Loved, loved, LOVED Sweetness. Like you, I want to read more in the series! Also loved Hotel and Walk with Jane; How Do I Love Thee, not so much. Of course, Staci's Organized Heart is great!